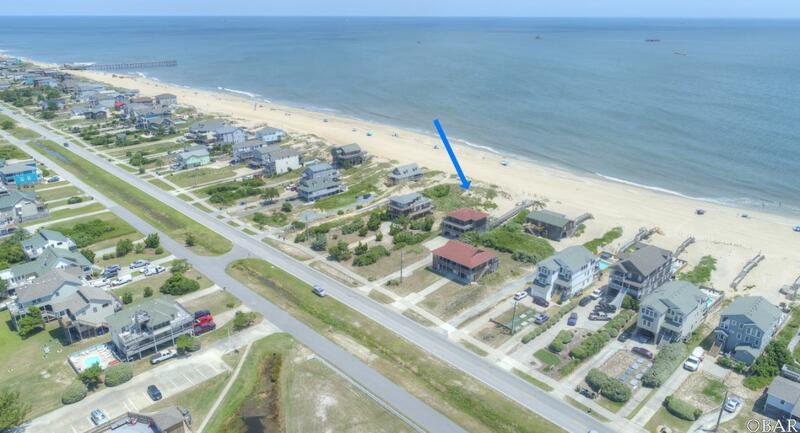 Lowest priced Oceanfront Lot in Nags Head!! Mile Post 18 3/4 on Old Oregon Inlet Road! 50 ft wide and deep depth! See example photo for house that COULD be built on this lot. Use your imagination! So close to the Outer Banks Fishing Pier & Fish Heads Bar and Grill you can walk down the beach or the sidewalk. Live bands and good food steps from your door!! Build big or small. South Nags Head offers a slower pace and family oriented atmosphere. Nice tall vegetated dune along oceanfront and wide beach. Can you imagine Ocean & Sound views from a second floor deck. Breathe in the salt air, everyone needs a little salt therapy. Recent 2017 survey in photos. Taxes are for combined lot 15 & 16. Lot 15 is for sale. Looks like there is possibly room for a pool as well. Beach nourishment scheduled to begin in May from Bonnet Street in Nags Head down to MP 21 which means more beach to enjoy! Excellent value for location and size! Come build your Outer Banks Dream Home or Cottage!